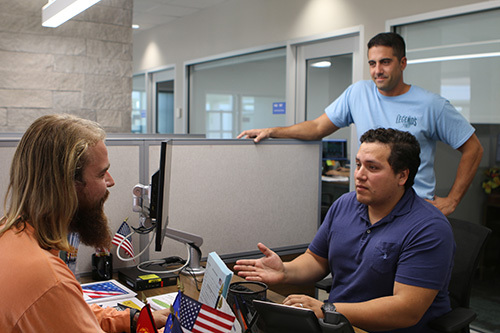 The new Veterans Success Center on the Lake Worth campus opened in 2018. Palm Beach State College has earned national top 10 rankings from two prestigious military publishers for the second consecutive year. Viqtory and Military Times have placed PBSC fourth and seventh respectively on their lists of the best higher education institutions for veterans, which in turn makes PBSC the highest-ranking Florida school in its category. 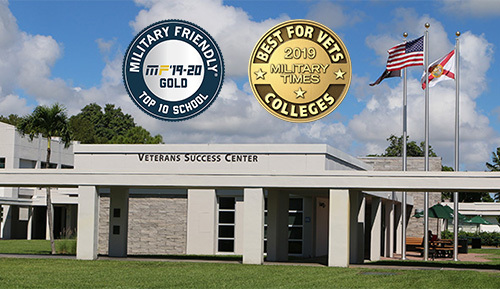 Viqtory, formerly known as Victory Media, has again designated PBSC a Gold “Top 10” Military Friendly® School, the highest level, and increased the College’s rank from seventh to fourth among large public postsecondary institutions in the U.S. The 2019-2020 Military Friendly School lists will be published in the May issue of G.I. Jobs magazine and can also be found at www.MilitaryFriendly.com. Now marking 10 years of publication, the highly respected Military Friendly designations went to 766 schools that were shown to provide the best opportunities for veterans. The rankings were based on both public data about each institution and proprietary data gathered through a free school survey. The survey questions, methodology, criteria and weighting were developed with the guidance of an independent research firm and an advisory council of educators and employers. Ernst & Young audited the process. In Military Times’ 2019 Best for Vets: Colleges list, PBSC moved up from eighth to seventh among two-year institutions nationwide. The annual list, now in its ninth year, is based on the results of Military Times’ rigorous and editorially independent survey, which asks colleges and universities to disclose academic data, describe the veterans culture on campus and document the range of services, policies, accommodations and financial incentives offered to students with military ties. Military Times also conducts a detailed review of public data collected by federal agencies. About 500 colleges completed the free survey, but fewer than half received the designation. The rankings are published in Military Times magazine, as well as online at Military Times.com. The College opened the new Veterans Success Center in September. The 2,300-square-foot facility features a lounge for social and recreational activities, study areas, a computer lab, tutoring, mentoring, academic and career advising, benefits counseling and more. This one-stop access point for services, resources and staff is empowering veterans, military service members and their families to succeed. The three campus centers also help veterans meet other veterans and find camaraderie with those who know what they’ve been through. “Initially guys who are transitioning will come here, and many times I’ve just hung out and kicked it around with a few veterans who are freshly out,” said VA work-study student Jacob May, former U.S. Army sergeant who is currently an Army reservist. 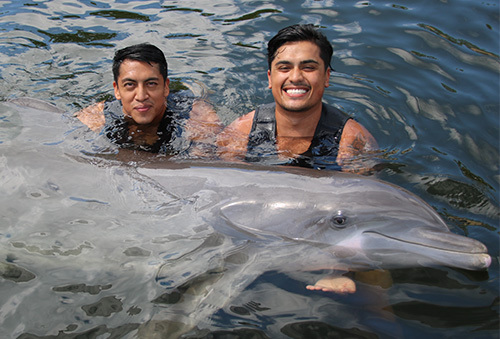 Student veterans Juan Domingo and Freddy Mendez at Island Dolphin Care in Key Largo. The Veterans Services staff supports approximately 1,100 student veterans a year, including organizing activities to enhance the college experience for these students on all campuses and in the community. One example grew out of a partnership with Island Dolphin Care, a unique facility in Key Largo that offers free-of-charge, therapeutic encounters with dolphins for veterans who have been wounded while in the military, including those who return with PTSD. For more information about the Veterans Services department, call 561-868-3380 or visit www.palmbeachstate.edu/VeteransServices.